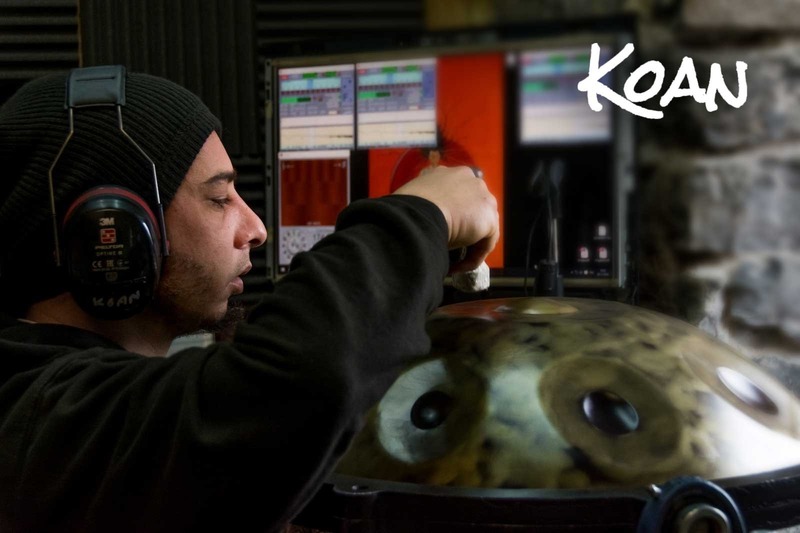 Today I’d like to share an interview with Oré, an amazing French handpan maker whose instruments are known by the name of Koan. Above all, Oré is a true friend whose seriousness and simplicity inspire me. Here is a contentender for France has got talent: Mr Oré! Hi my friend! Can you tell us a little bit about yourself? My name is Aurélien. Before becoming a handpan maker, I was the manager of a hair salon in the south of France for around 10 years. I now live in the mountains, right in the middle of nature. I really love the peace and quiet of this environment. As you might guess, I’m an avid fan of DIY and construction. I have been playing handpan for 8 years, and have been making them for 5. What made you decide to start making handpans? How did it all start? I’ve always been fascinated by the instrument. I started off by making tongue drums to see how I got on at first. Subsequently, I developed the Zagdrum. At the same time, I was trying to understand the processes involved in handpan fabrication. This proved a difficult task, as I had very little information to go on, although this made the path I took all the more interesting and educational for me. Definition: In the Zen tradition, Koan is an enigma whose purpose is to remove us from the logical and the rational to allow a different view on the world. Koan exists to help us to unlearn and to free us of our prejudices and projections. This is exactly how I felt when faced with the steel, and how I still feel now! KOAN! What do you like most about the handpan and its community? What I like about the community is that people are open, tolerant, and easy to connect with. It’s crazy that you can go anywhere in the world and find a handpan player to welcome you and have a jam! What do you like most about making and selling instruments? My favorite part is tuning, because all your senses are alert and need to function on a higher level. It takes all your concentration and attention to really feel what the steel is telling you. You have to feel its reaction under the hammer blow and having only a fraction of a second to interpret it, listen to the steel and understanding its strength, its elasticity, and listen to and distinguishing different frequencies. Having all your senses on full alert is what fascinates me and draws me in. We learn, and we try to understand the metal, realising that it is the steel itself that dictates what is or isn’t possible. It’s very challenging and requires a lot of patience and perseverance. Your physical and mental state have a big impact on how well you tune. When making, I also enjoy seeing the metal going through a process of change until it finally becomes an instrument. Honestly, the sale in itself, although necessary, isn’t of much importance to me. However, it gives me so much pleasure to see happy clients, and their smiles as they play. What are the values you put into your work? Consistency and seriousness. We always try to go further but often it is at the detriment of quality. My aim is to concentrate, channel my energies, and keep making progress in the quality of the instruments that leave the workshop. Can you tell us about one of your latest creations or innovations? We have just validated a 10 note scale (including the ding), which up until now was proving a real challenge. I’m really pleased with it as the quality is even better than that of a 9 note instrument. The scale is D Amara. Do you have a favourite saying that you can relate to the handpan, music, life, even? Do you have any tips or advice for someone who would like to start making handpans? You must be armed with courage and perseverance, and be well-informed before starting out. What’s your website and any links to some of your beautiful videos?